* Legacy Product: Limited extended availability for our long-term commercial customers, but not recommended for new designs. Please note that this product was also replaced by the C6713Compact-2. The micro-line C6713Compact offers a highly flexible DSP/FPGA single board solution for developers requiring integrated DSP, FPGA, and FireWire resources. It can be used as a stand-alone system, or as a mezzanine daughtercard embedded within a larger system or board design. The design incorporates a high performance TMS320C6713 floating-point DSP Processor, a Virtex-II FPGA, IEEE 1394 FireWire communications interface, up to 64MBytes of SDRAM, and 8MBytes of FLASH ROM. In situations where additional functionality is required, developers can extend the capabilities of the C6713Compact with their own application-specific hardware. 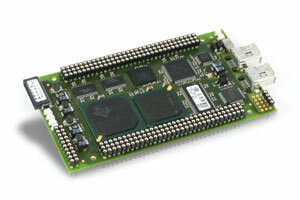 External hardware is easily interfaced with the TMS320C6713 processor or connected directly to the Virtex-II FPGA. External access to TMS320C6713 DSP I/O interfaces: 32-bit EMIF, XF0/1 flag pins, Timer input pins, Timer output pins, McASP & McBSP ports, I2C, and Host Port interface. The optional micro-line power supply functions as a base for a micro-line stack of DSP, data acquisition and I/O boards. It delivers power to the micro-line stack and provides additional services such as RS-232 communications connector, a reset button and a power-on indicator. OEM developers may wish to mount the micro-line stack on their own hardware. The on-board FireWire interface facilitates C6713Compact integration with other embedded DSP resources, cameras, sensors, and host computers. FireWire provides guaranteed bandwidth for mission critical applications, live connect/disconnect, and many other impressing features.